I can't in good conscience wrap up the school year sans an END OF SCHOOL cartoon — so, I'm sending you two of them. If one is good, two is better, eh? HA! Usually, when we think of a school year ending, we picture Graduation — leastwise, it's the most publicized of END OF SCHOOL events. And yet, other less heralded events are also part of the "ending" mix. 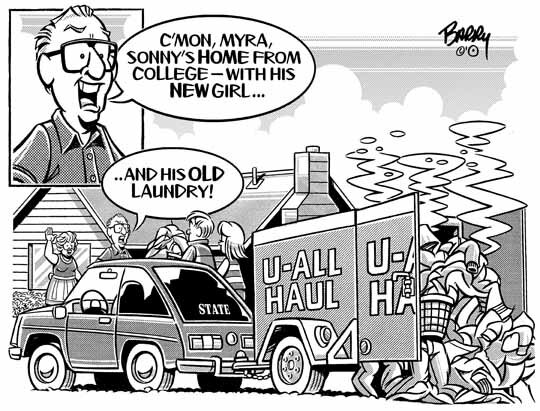 In this toon, the event featured involves a kid returning home from college. Gotta say, in every cartoon I create I always empathize with one of the characters. In this case, it's the Mom. She's sooooo excited at first glance — but, only sees part of the "return" equation.